Anneke Scott is a leading exponent of historical horn playing. Her work takes her throughout the globe and throughout the centuries of music with a repertoire incorporating music and instruments from the late seventeenth century through to the present day.Anneke is principal horn of a number of internationally renowned period instrument ensembles including Sir John Eliot Gardiner’s Orchestre Révolutionnaire et Romantique and The English Baroque Soloists, ensemble Pygmalion, The Orchestra of the Sixteen, the Irish Baroque Orchestra, and the Dunedin Consort and Players and many others. She is similarly in great demand as a guest principal horn regularly appearing with orchestras and ensembles worldwide. Anneke enjoys an international solo career and discography embracing three centuries of virtuosic horn works. 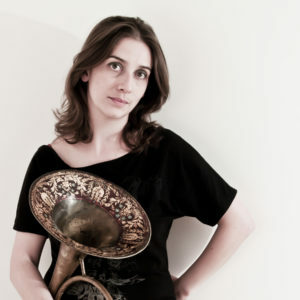 Her expertise in baroque horn repertoire ensures that she is frequently to be heard performing the famous obligato arias of composers such as Bach and Handel as well as solo concertos from this period. Her critically acclaimed solo recordings also include three discs focussing on the music of the leading Parisian horn player of the nineteenth century; Jaques-François Gallay. Anneke enjoys collaborating with a wide group of musicians and is a key member of a number of chamber music ensembles including nineteenth century period brass ensemble The Prince Regent’s Band, the harmoniemusik ensemble Boxwood & Brass, historic wind ensemble Syrinx and ensembleF2. She regularly works with leading period keyboardists including Steven Devine, Neal Peres da Costa, Geoffrey Govier and Kathryn Cok and period harpist Frances Kelly.